First of all, I do not consider myself a professional let alone an expert on PowerShell. However, I think the learning curve of PowerShell is very appealing especially if you have got some background in programming. The first programming language I learned was Java…way back in 2005 at University. Well, frankly speaking my first programming language was Basic on a Commodore C128 computer…but that time as a teen I didn’t really get a deep understanding and ended up retyping listings from books….so that doesn’t count. Opposed to Linux Shell, PowerShell feels very similar to coding Java. It doesn’t matter how you format the code…you don’t have to put attention on such things as line endings and carriage return and don’t have to use vim at all :-P. Well…enough on that admittedly biased and poorly educated comparison…which is probably not what Rob asked for. I hope you dear reader are not yawning yet…because that’s so simple and fundamental what I write about…. I have got a variable $logFolder for the loggingPath. Within that Path I generate a filename consisting of the scriptName and a timestamp. Finally I am just writing information into that file. This is achieved by using linux-like > $logFile which creates the file and writes the first line to it. Following logging uses >> $logFile in order to append to the file. Scripting pros like Rob could argue that it would be better to write a separate function for logging purposes and just call that. I am fine with this way as it doesn’t involve much more code than a function call (just repeating the Get-Date Part over and over again). Next one is about querying sql server tables. For this purpose I use the module sqlps, which you have to import first of all. The SQL is executed using Invoke-Sqlcmd which uses good old sqlcmd.exe under the covers. Naturally you have to provide the InstanceName, DatabaseName and the query itself. This one uses integrated security…so there are no credentials. Next let’s iterate through the result set and do something with the query results. Iterating itself is quite elegant using ForEach. I have got the result of my query in the variable backupFileList. ForEach extracts the current record in the look into the variable backupFile. Now I can access each column using <variable>.<columnname> (for example $backupFile.FileSizeMB). That’s great! I don’t know if the correct PowerShell termin for the variable is “object”…but that’s quite what I think it is and how it looks like compared to Java. It’s possible to assign new values to the properties of the object or to just read them. Here I determine the size of each file, save it into the property FileSizeMB. Additionally I add each filename to a new variable $selectionList which is the format BackupExec expects the file selection list to be in. I am just combining the object with the command using the pipe (|) symbol, then tell it which property to measure and the type (could be multiple like -Sum -Average). This returns another object…in order to just access the value I access the property Sum and that’s it! Great and easy isn’t it? The cmdlet Select(-Object) enables you to choose some specific properties for further processing. As you can see in this example it is even possible to do some calculations using expressions. In this case this is just for keeping the ouput of file size small and shorten it to two decimal places. Afterwards Sort(-Object) helps with sorting the list. The best part of it all is the Format-Table cmdlet. This generates a nicely formatted and aligned text table from all the values. Well this last paragraph is quite a basic one. Throughout the examples you have already seen some examples of variable assignment. This is quite straightforward using the “=” operator. For example: $continueProcessing = $FALSE; sets the variable $continueProcessing to the boolean value false. This checks if the variable $continueProcessing is set to the boolean value true. For a full list of comparison operators have a look at the documentation. 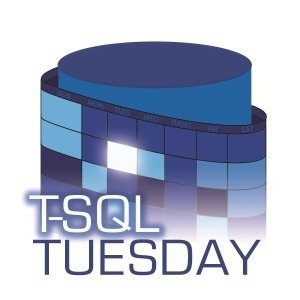 That’s my first contribution to TSQL Tuesday. I hope you found something valuable to take along. As already mentioned I am no PowerShell Expert and far from programming PowerShell each day. So if you are more experienced than me let me know what I could do better next time.